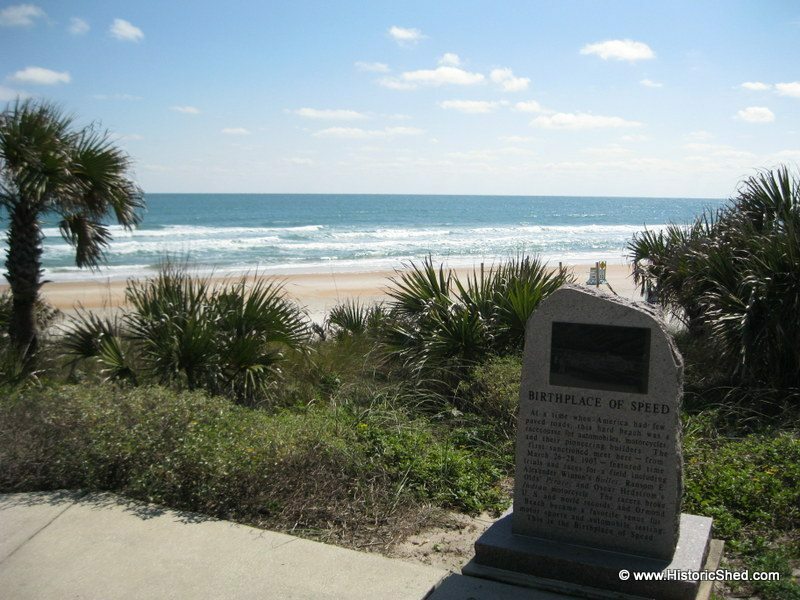 The City of Ormond Beach, Florida proudly titles itself the “Birthplace of Speed” with a long history of auto racing that started in 1902 on the hard packed beach sand when automobiles were new and existing roads were poor. 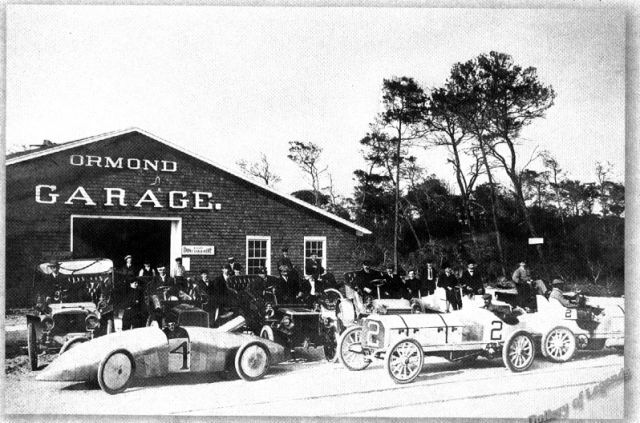 After the Winton Bullet won a Challenge Cup against the Olds Pirate by a breathtaking two-tenths of a second in 1903, Ormond Beach established itself as the ideal proving ground for automobile designers and racing aficionados from around the world. 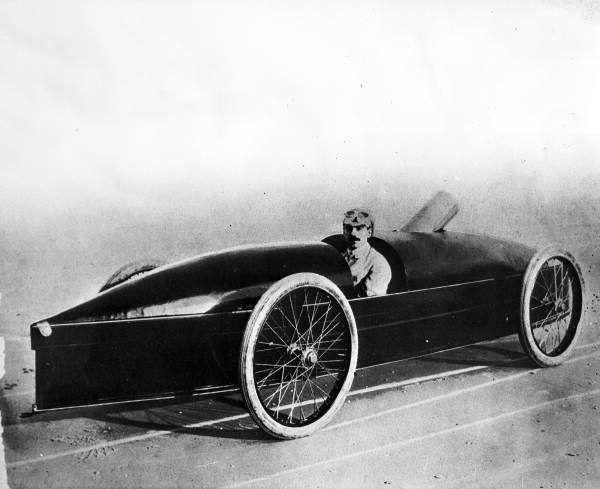 Motorcycle and automobile owners and drivers brought vehicles powered by gasoline, steam and electric engines, sometimes cruising at over 100 miles per hour along the ocean side. 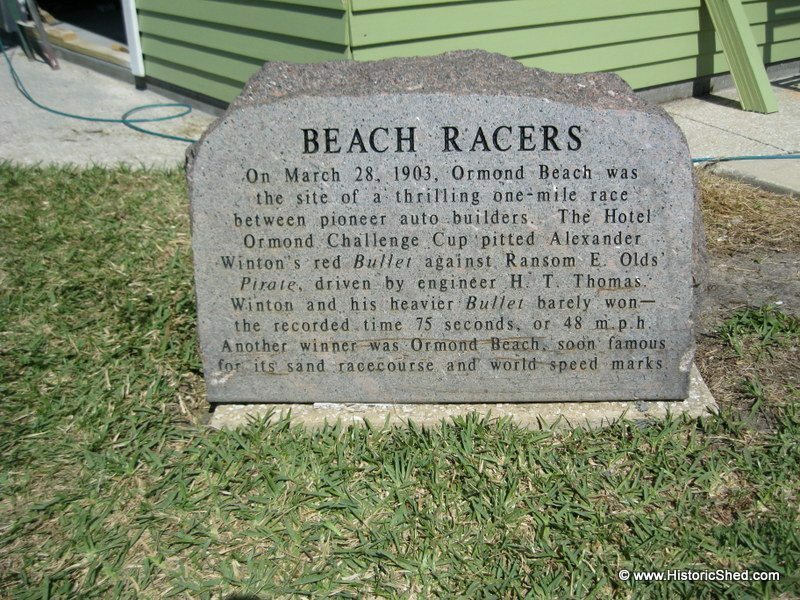 You can see actual race footage on the beach from 1905 on YouTube at Ormond Beach Florida Auto Races. 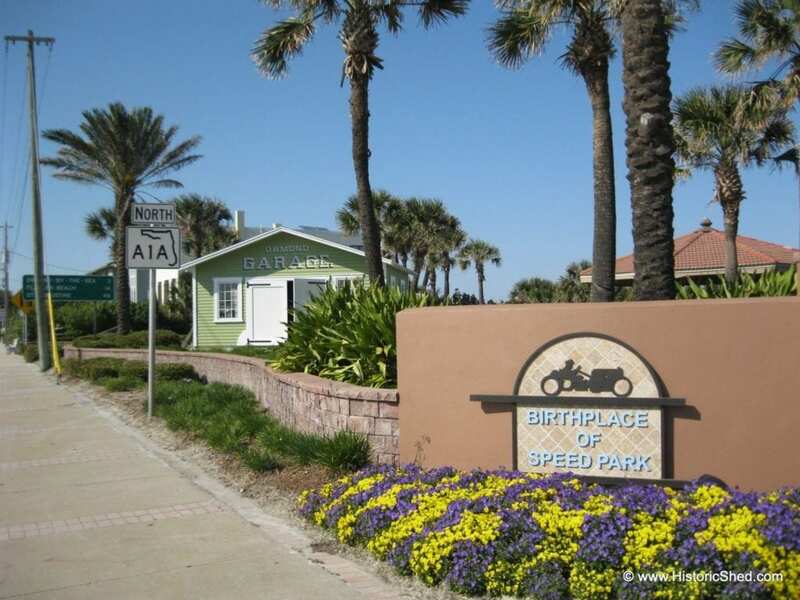 While autos may still drive along the beach, beach racing is now only commemorated at Birthplace of Speed Park, located on A1A at the intersection of SR40. The park has a series of markers telling the story of racing and provide wonderful views of the ocean. View of the ocean from Birthplace of Speed Park in Ormond Beach. What an amazing place to work! 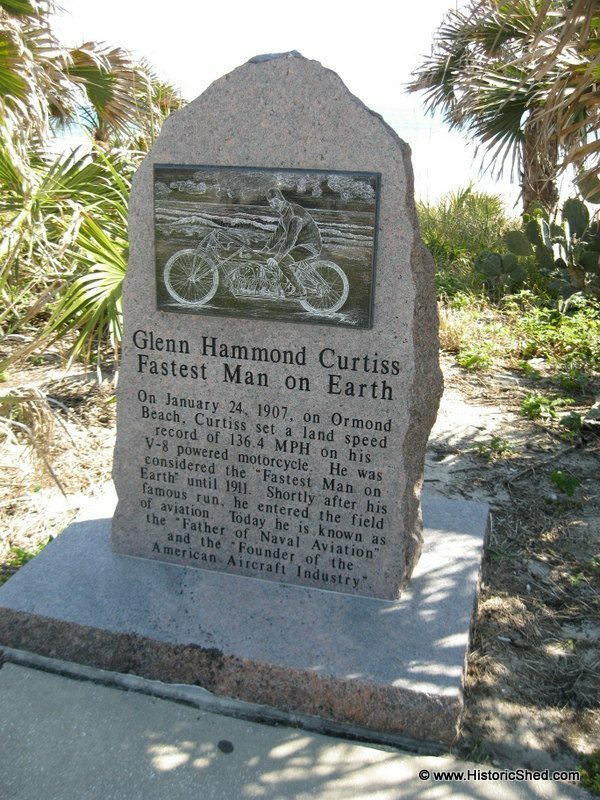 Glenn Hammond Curtiss set a land speed record of 136.4 mph on his motorcycle on Ormond Beach in 1907. Other markers are located around the park. The park used to showcase two replicas of the two history-changing racers, the Winton Bullet and the Olds Pirate, but the ocean climate made maintaining the cars difficult and they were removed for repairs. 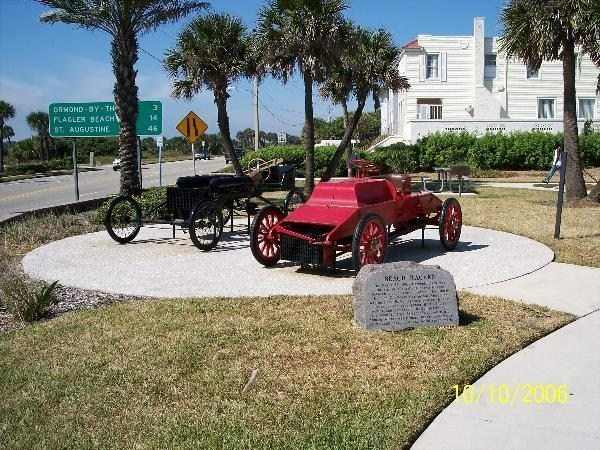 Members of the Motor Racing Heritage Association decided that it would be ideal to bring back another piece of Ormond Beach racing history and place it in the park to protect the replica cars. The replica cars that were on display in the park. 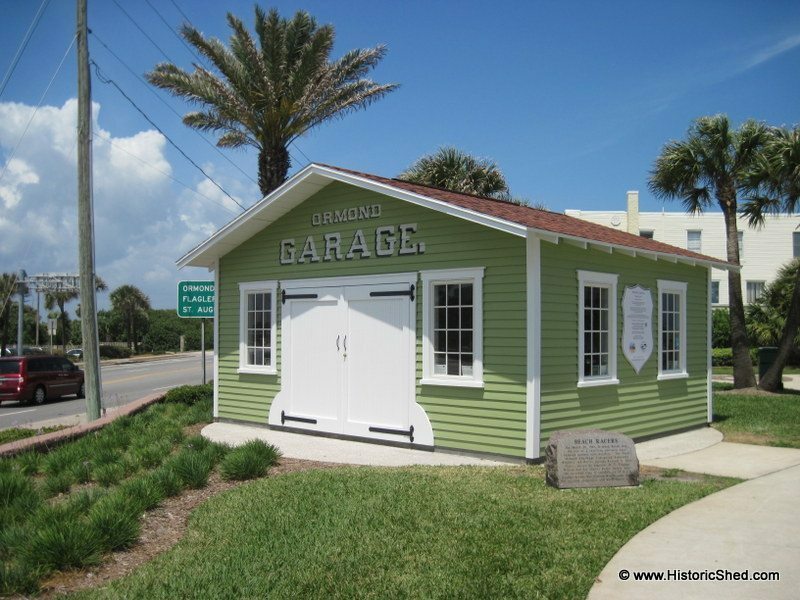 The Ormond Garage was built in 1904 by Henry Flagler, railroad magnate and owner of the Ormond Hotel, to accommodate participating race cars during the beach races (and to keep them away from the front of his hotel). The large garage housed the drivers and mechanics during the speed time trials, while the owners and manufacturers stayed at the hotel. 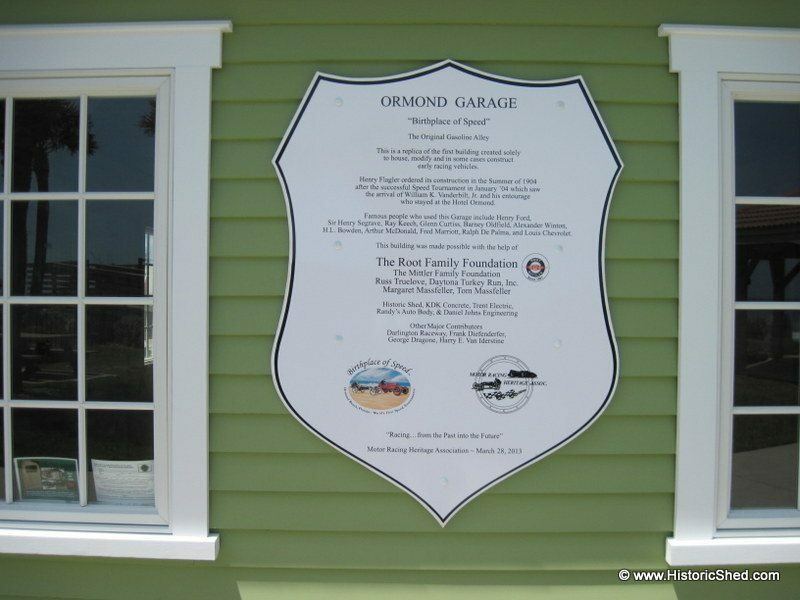 The Ormond Garage stayed the center of racing for many years, later storing antique cars and racing memorabilia, but unfortunately burned down in 1976. 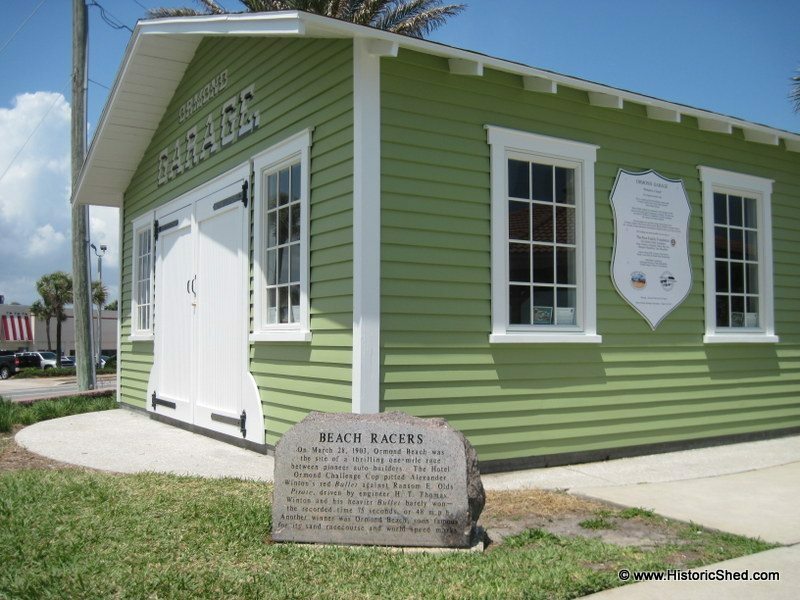 While much larger than could be accommodated within the park, the old garage was to serve as design inspiration for a new structure to house and protect the replica race cars in Birthplace of Speed Park. The Motor Racing Heritage Association began fund raising in order to build the garage, and came to Historic Shed to discuss the project. After a few design iterations to make the project more affordable, and a couple of years of fund raising, the project was officially launched at the end of 2012. 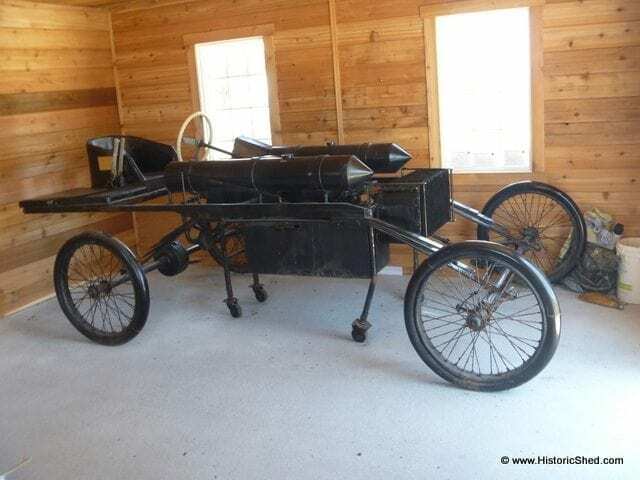 Last week, the interior was completed and the first of the replica cars will move in shortly. Installation of the new garage building in Birthplace of Speed Park by Historic Shed. The garage was hand-lettered by Spike Signs giving it the perfect accent and reference to the original garage. Marker in front of the new garage telling the history of the two replica cars. 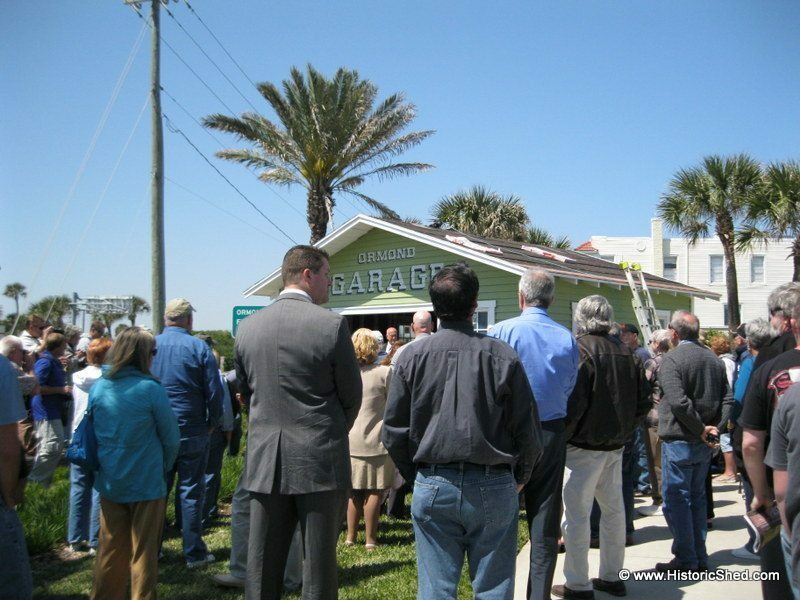 The garage was dedicated on March 28th, 2013, 110 years after the race that made the beach world famous. A sign was posted on the side of the garage about the project and its supporters. The sign is shaped like one that decorated the original garage. Other memorabilia saved from the historic garage will be added to the new garage. The finished garage sits nicely with the existing marker for an accent. 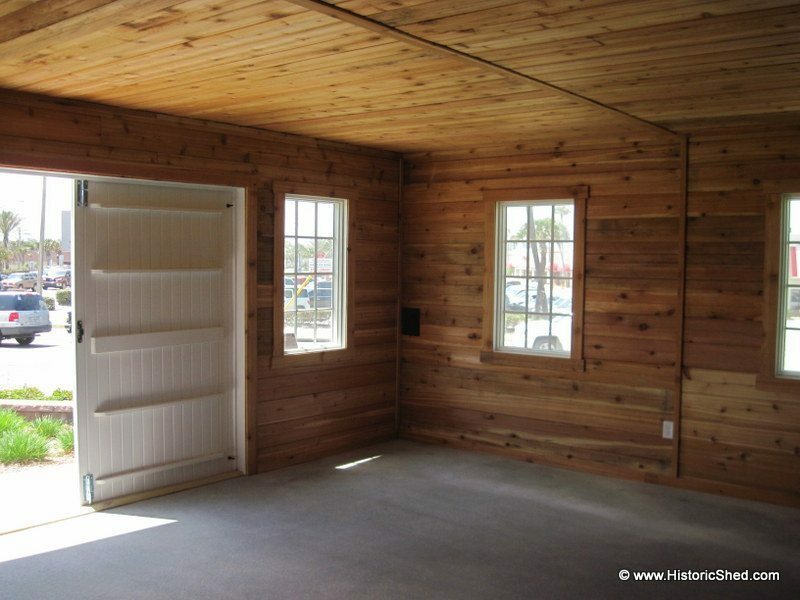 The garage interior was finished with grooved cedar boards. 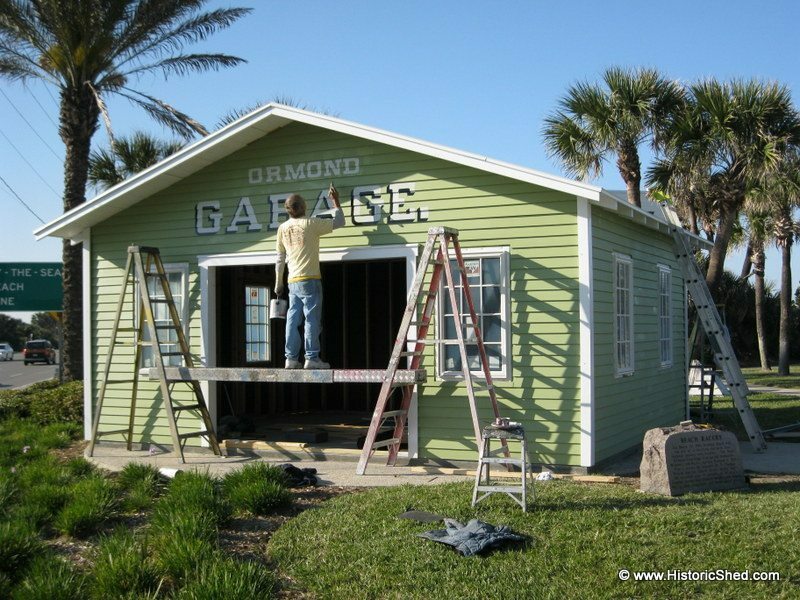 The new Ormond Garage in its park setting. This very fun project would not have been the same without Suzanne Heddy, Director of the Ormond Beach Historical Society and Motor Racing Heritage Association Treasurer; Ron Piasecki, President of the Motor Racing Heritage Association, Inc.; and Dan Smith, Hometown News writer and Motor Racing Heritage Association’s “Go To Guy” and the numerous other racing history fans in the area. We offer so many thanks for their direction, entertainment and support! I am interested in a two car garage with apartment/Care Giver Quarters based on the One Car/Apartment design viewed on your website. Thanks for the inquiry. I will send an email shortly. You made it same designs of garage and congrats that you done very good job.thanks for sharing this. Nice work. What a great and meaningful project, culminating with such a beautiful result. Many thanks. Looks great! I had pictures, too! Sorry, I should have sent them to you. You did a great job. Great looking garage. Was in Daytona last week and wanted to see the garage , but had to leave due to a death in the family before I could visit the Ormond Garage . I have been working on building my own Pirate Replica for some time now. Maybe some day I will be able to drive my replica on Ormond Beach. That would be so cool. Anyway , congrats on a job well done. I understand the Pirate & the Bullet replica models will be on dispaly in the garage when they are refurbished. It will be a great sight to see. I would just like to comment that the Motor Racing Heritage Association appreciates being mentioned in the Historic Shed Blog. It was a long road getting to the point where we could commit to having the Ormond Garage Replica built, but as you can see in the pictures, the finish product was well worth the wait. 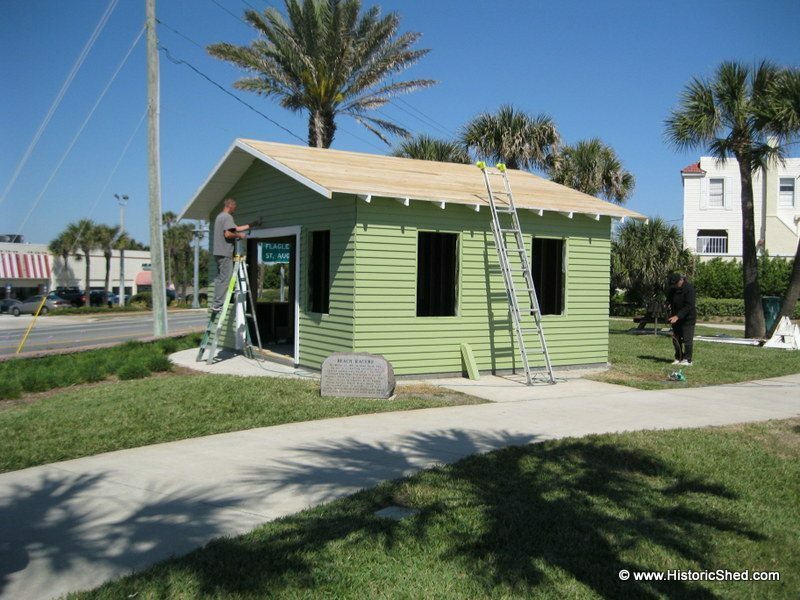 Historic Shed did an outstanding job creating the Replica and we would recommend them to anyone looking for a high quality building. It was a pleasure working with them on this project. So glad you are pleased! We loved working on your project and working with you all.